There's another task called "default task-6" that has exactly same thread dump. These machines have 2 cores, so one task takes 100% of core 1 and the other fully uses the other core, so CPU is under 100% load. 2) This does not happen on fresh restart; only after a day or two. When I look at CPU usage monitoring for those machines I can see that CPU usage went to 100% not instantly, but over a course of 3-5 hours (gradually increases to 100%). 3) The Wildfly machines are connected to outside via apache2 and AJP. Apache2 handles the SSL, not the Wildfly, so it is not the known issue/bug with Undertow and HTTPS. 4) I even thought that someone simply DDoSes servers and loading JSP pages causes high CPU load. So, I turned off just the apache (basically made it unavailable to public) and CPU usage remained at 100%. Therefore, it's not due to external load of any kind. 5) I have total of 8 machines with Wildfly 8 Final in standalone mode. All of them behave exactly like described above. Some start doing it earlier, some later. Some machines at first have 50% cpu usage (one core @100%), then after some time the second core goes to 100%. 6) The garbage collection CPU usage is low or close to 0% according to VisualVM. How can this problem be solved? I couldn't find anything about this elsewhere online. Finally, if any more information/debug is needed, I will be happy to provide it. This might be a bug. I've raised UNDERTOW-200. That's good to know, Stephen, thank you. Voted for the issue and signed up to watch it. Good evening - I'm testing the Wildfly 8.0.1 Snapshots and the issue is still present. It's pretty confusing to me as what the cause for it might be now. 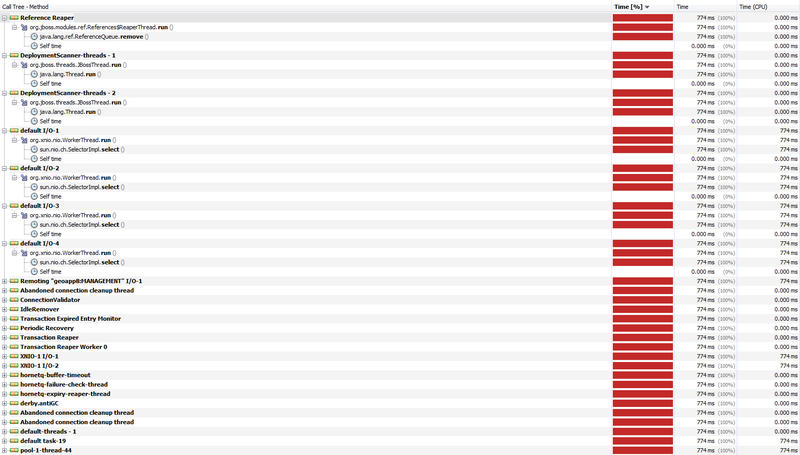 According the the visualVM images above it seems like everything uses 100% of CPU at once. The one symptom that remains the same here is how at first CPU usage is normal (close to 0) but then in a day it goes to 100%. This is the only issue that prevents me from using wildfly 8 in production right now. Everything else works like a charm, but with this problem I'd have to reboot machines every day or so. This screenshots don't show anything out of ordinary. Are they done when cpu load is 100%? as you can see maximum time spent by any thread is 153ms which noting. can you maybe try with Yourkit or some other profiler to show more accurate info? The above screenshots from visualVM were done when the issue is happening and actual cpu was at 100%. I'll try YourKit profiler next. I think the simplest and the most informative data to get when you have the 100% CPU usage is to take 2-3 thread dumps with an interval of around 5 seconds between each of them. Those I believe will be good enough to narrow down the issue. Taking thread dumps is explained here ThreadDump or you can even use jstack (which comes bundled with the JDK). Noting really stands out except maybe the jca validation thread. The above happens when I attemp thread dumps using VisualVM. When machine/jboss is restarted thread dump in VisualVM works just fine, but when it enters that problematic state when CPU is 100%, making thread dumps is not possible (at least via visualvm). oh, wow. I've been trying unsuccessfully to make 3 consecutive thread dumps since yesterday, but as soon as I posted about it I succeeded on one of the machines. So attached are my 3 consecutive thread dumps. [pid] is the process id of the container "usually shows up as java". I've tested this under linux environments, -F flag tells it to force the thread dump when the program is unresponsive. Here are 2 more thread dumps attached. They are from 2 different machines and created using jstack command. More details about these particular dumps: As mentioned earlier, these machines have 2 CPU cores each. So at the time of this dump those machines had 1 of the 2 cores loaded at 100%. I will also wait for some other machine to reach a state when both of the cores will be loaded 100% and upload those dumps as well. 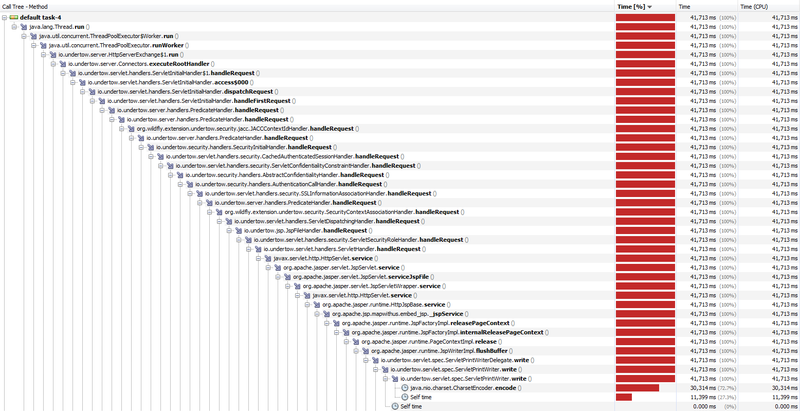 Almost the same behavior, this time I can now identify two rogue java process ( See picture ). This looks like idle-removal thread issue see Re: Wildfly8-Idle Remover Thread taking 100% CPU Usage for more discussion on this same topic.